Fat bikes are a blast. Maybe it’s that new, like a new toy at Christmas or is it the rush of a new fun activity. It could just be that riding a bike in the snow gives me the thrill much like the rides of summer but just a tad colder. Winter Park is unique in the fat bike world. We have hundreds of miles of trails and roads to ride. Unlike many areas that are limited in variety of experiences we seem to have an ever growing number of options. Many of our favorite trails from summer are available to be ridden in the winter. 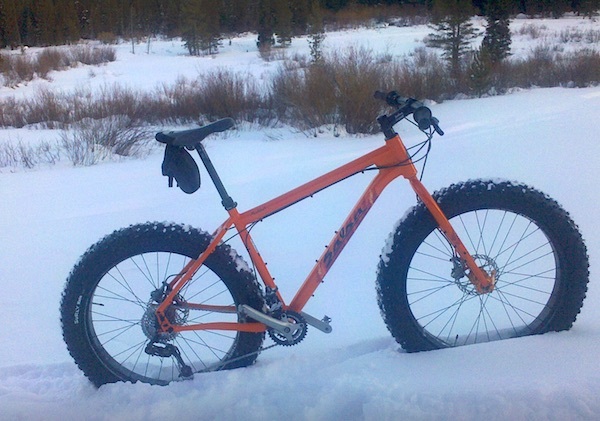 In addition cross country ski areas such as Snow Mountain Ranch and Devils Thumb have embraced fat tire bikes as well. This winter experience adds credence to Winter Park’s claim of Mountain Bike Capital USA. The type of trails tend to vary as much as summer if not at times a bit more. Snow conditions, trail widths and compaction from other users are just some of the factors that help create and mold your experiences. I prefer packed snow a day or so after a storm vs. new. Colder (i.e. freezing or below) offers better traction then warm. I tend to look at trails as following into 3 types. This is summarized but will give you an idea of options. Those are compacted roads and compacted trails by vehicles such as snowmobiles as well as single track created by skiers and other fat bikers. The easiest of all trails tend to be USFS and county roads that have been compacted by motor vehicles, snowmobile or other means of motorized transportation. These tend to be the most compacted which offers the greatest traction while being the least technical. If you have never been fat tire biking before then these types of trails may be the best place for you to begin. Examples of these type of trails would be St. Louis Creek Road, Elk Creek Road, Vasquez Road, Little Vasquez, Fraser River Trail and USFS 159 to name a few. The next level of experience and difficulty are those compacted predominately by snowmobiles and skiers. These tend to ride like wide single track. Difficulty levels can increase depending on the compaction of the snow. Hard pack and the bike will roll pretty fast, sometimes faster than on the dirt. If the snow is a bit loose then you will be challenged a bit to keep traction. If you have experience on a mountain bike then these will be a fun but good challenge for you. Examples these trails would be D4, Blue Sky and Sunken Bridge. True single track is typically created by skiers, fat bikers, and snowshoe users. This can be the highest difficulty level as the compacted area is often less than 18″ wide and sometimes as narrow as just a few inches. Fat Bikers call it riding the beam. Even the best riders slip off into the deep snow or take a tumble. Examples of some single track would be Crosstrails, Winter Woods, Ditch Trail, Sun Dog and Sunset Pink as well as others. If you haven’t been out on a fat bike then you should. Start easy and then work up to harder difficulty levels. The bikes can be a lot of fun but as with any sport start within your ability and when you are ready explore greater challenges. Looking for more information? Like Grand Mountain Bike Alliance (GMBA) on Facebook. GMBA is your local mountain bike group. Check out Mountainbikecapitalusa.com. Great site by the Winter Park Chamber!